As the Commander, your mission is to build and expand your colony to its fullest. You will purchase new factories, such as Titanium and Microbiotics, operating each of these with either Humans or Robots. You will also compete via bidding to acquire colony upgrades, such as Orbital Labs and Planetary Cruisers, making your colony more efficient and successful. Your success, as well as the success of all the other Commanders on the planet, will be judged based on how large and efficient your colony becomes. The Commander who builds the greatest colony gains the title of Outpost Director and wins! 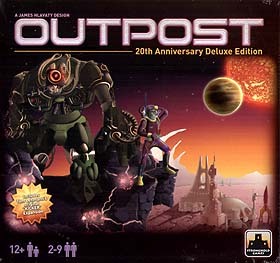 Outpost is a reprint of the highly sought-after "grail game" originally published in 1991. Stronghold Games' edition of this great game contains vastly upgraded components plus the never-before released "Kicker Expansion" designed by noted designer, Tom Lehmann!